"While I was drawing, his elbow moved my hand so now my princess has a moustache!" "She moved eight spaces instead of seven! I saw it with my own eyes." "He ate the last lolly even though I had written on the box, 'Do not eat the last lolly!'" You're expected to mediate, to help find a solution — for the 17th time this morning. No more, you say. It's time call in an unbiased third party. 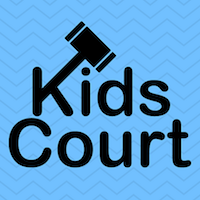 Kids Court, a free skill on Amazon Alexa, lets kids take all their complaints to Judge Lexy, an objective judge who will help them settle their battles. Yes, it's just for fun, but it really is fun — parents report that their children go into "court" with real issues, and come out giggling and more knowledgable about the legal system. The skill, created by Adva Levin, was the grand prize winner of the most recent Alexa Skills Challenge. How to use it: First, say "Alexa, open Kids Court" on any Alexa device. The session begins with a bugle introduction and the sound of a gavel. Judge Lexy asks for statements from the prosecutor and the defendant (kids can ask "What's a prosecutor?" if they're unsure). Then it's time to call witnesses and present any evidence. As the children speak, Judge Lexy picks up on keywords, and responds. (Don't worry — no information about the users is stored, and the skill complies with Children's Online Privacy Protection Act.) The conversation feels seamless, and Judge Lexy works in some silly quips and surprises. On Devpost, Levin writes that throughout the whole process, kids "learn to stand up for themselves in a calm manner, to articulate their problems coherently, and to take responsibility for their actions." The grand finale is the verdict. Levin designed an algorithm to determine whether or not the defendant is guilty, though it isn't clear how she came up with it. Judge Lexy states her decision, along with a funny dare that the losing side must execute (i.e. "Try to stand on your hands."). If the kids aren't satisfied with the decision, they can file for an appeal. Who knows? Kids Court might help your kids stand up for themselves and fight for justice. Be warned, though: You might just find yourself using the skill more than you expected. Writes one reviewer, "My wife prosecuted me for not taking the rubbish out." This is just irresponsible advice about parenting and your relationship with your children. Teaching kids conflict resolution in a fun way while also helping them learn about how the legal system works sounds great to me. Your comment sounds like the inevitable complaint from some snowflake who doesn't have children. I'd much rather arbitrate a dispute myself then rely on a device and software to do it. Especially if the decisions seem to be arbitrary as the article seems to imply. I think it's more important for the kids to learn to respect your decisions not the decision of a piece of furniture. I can see your logic there, I agree that it shouldn't be an alternative to proper parental discipline. I see it as more of a diversionary tactic to help stop every little petty squabble form being escalated out of proportion. I would also hope it could give them, to a small extent at least, an understanding of the vocabulary and logic required to solve disputes themselves without having to refer to a piece of furniture every time. Yeah that's possible too. Maybe just use it for petty disputes rather than anything that genuinely needs arbitration. A system that promotes delegation of parental responsibility to a device? A system that recodifies conversation into a nonsense legal framework? Of that's being a snowflake then allow me to stand with those who don't believe an app is the solution to everything. It's all fun and games until Timmy is wrongly convicted of eating the last cookie, blames "the system", locks himself in his room listening to N.W.A. for two weeks and then goes on a shooting spree, shouting "Justice for my people".